WILMINGTON, Mass., Nov. 29, 2018 /PRNewswire/ -- For many businesses, the holiday season is wrought with finding a special corporate gift to reward employees for a job well done. If businesses want to make a lasting impression this holiday season with a gift that keeps on giving, a managed workwear program just might be at the top of their list. A past study conducted by JD Power and Associates® sponsored by the Uniform and Textile Service Industry concluded that branded uniform programs provide many benefits to both businesses and employees alike. Furthermore, a recent NBC News online report revealed that employees feel more confident and professional when they wear uniforms. "Unique, branded uniforms worn on the job can have a positive impact on workplace culture and staff productivity, and can lead to greater customer satisfaction with bottom-line benefits," says Adam Soreff, director of marketing and communications at UniFirst, a leading provider of uniforms and workwear to businesses throughout the U.S. and Canada. "It has been proven that customers are more inclined to do business with employees who wear uniforms because they look more capable and appear more competent and knowledgeable." Provide an employee benefit. Employer-provided uniforms and services save employees money and, when provided as part of a managed rental program, eliminate employee laundering time and expense. Create an attractive business image. For better or worse, society often tends to judge people by how they dress, or how they look. Selecting a professional-looking employee uniform can immediately establish a more desirable business image that helps attract and retain customers, while differentiating them from competitors. Foster team spirit. Branded work uniforms promote a sense of team spirit and a sense of belonging. This, in turn, can improve worker productivity. Protect workers. Uniforms can deliver many functional benefits, including wearer safety. For example, flame resistant (FR) workwear can help prevent injuries caused by accidental electrical arc flashes or flash fires, and high-visibility uniforms can help employees be seen when working on or near roadside traffic. Improve security. Company uniforms featuring specific styles or colors for different departments can help people quickly identify who does or who does not belong in specific work areas or on job sites. Enhance customer relationships. Work uniforms immediately identify company representatives who can be easily approached for purchasing or service information, thereby improving overall customer service. Promote company pride. Work uniforms help instill a sense of pride and responsibility, and can lead to employees acting as company ambassadors outside the actual workplace. Communicate your company or brand. When employees wear uniforms displaying corporate logos and colors, they help brand and differentiate their business in the markets they serve. Provide free advertising. Well-designed work uniforms worn in public can become virtual "walking billboards," promoting a company's products and/or services within the market "for free." Prevent product cross-contamination. Specialized uniform programs designed specifically for the food or healthcare industries can help reduce cross-contamination threats thereby protecting the general public-at-large. 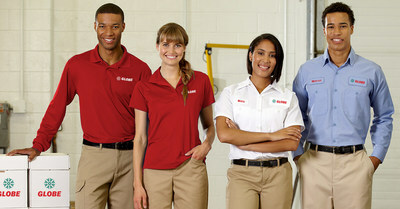 For more information about managed uniform programs or about UniFirst, please visit UniFirst.com.